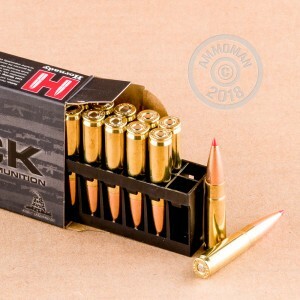 This 300 AAC Blackout ammo by Hornady is premium match ammunition perfect for your AR-15 or other favorite black gun. Each cartridge is topped with Hornady's innovative A-Max bullet. The 240 grain projectile features a polymer tip and a perfectly balanced copper jacket resulting in extremely aerodynamic performance and a high ballistic coefficient. Using only the best components, Hornady fills their reloadable brass casings with non-corrosive Boxer-primers and clean-burning powders. These rounds have a muzzle velocity of 1020 fps and a corresponding energy of 1006 ft/lbs. 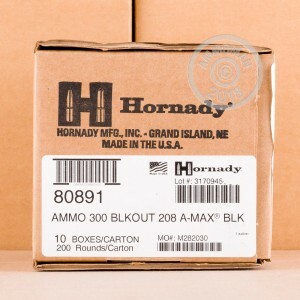 Hornady is a Nebraska based company established in 1949. Their commitment to creating the most innovative and effective ammunition on the market makes them a favorite among competitive and casual shooters. 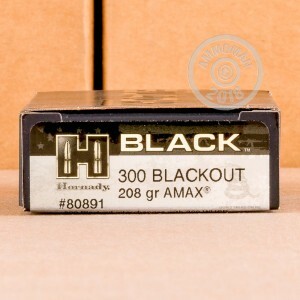 Order a few boxes of this premium 300 AAC Blackout ammo today!